With that powerful message, Corrie Pitzer, CEO of SAFEmap International, kicked off the 11th-annual Southern Company Contractor Safety Forum. The forum theme, “Team Up for Safety,” focused on how the company and its contractors together can share information, learn from each other and get everyone home safely every day. 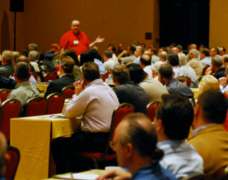 The importance of contractor safety to Southern Company is easy to see when you look at how much the forum has expanded since its inception 11 years ago. A vision of Safety and Health Director Don Gaddy, the first forum was held with approximately 40 people and included only contractors working on Engineering and Construction Services (E&CS) construction projects. Gaddy’s vision that the forum grow to include all construction functions in Southern Company is slowly being realized each year. 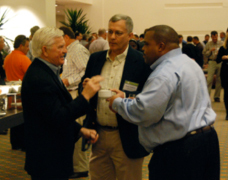 The forum has expanded to include all Southern Company business units and contractor groups, including generation, distribution, transmission, vegetation management, Southern Nuclear and Southern Power, making this year’s meeting, held Nov. 27-28 in Montgomery, the largest to date with approximately 470 attendees and 35 vendors. 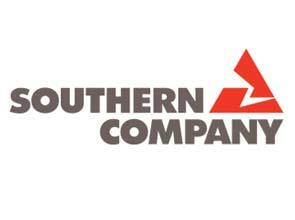 In fact, Southern Company includes many of its contractors in the planning of the forum and incorporates their ideas in Southern Company safety programs. Brad Cole, of Brad Cole Construction Company, said his company worked closely with E&CS to create its STEP (Safety Through Everyone’s Participation) program. Will Taylor, Construction manager, and Randy Hendricks, general manager of Construction – Coastal Region, talk with Donnie Hill of National Steel City, LLC during the vendor fair and reception. Todd Conklin, of Los Alamos National Laboratory, presents “Human Performance and Contractor Safety” to nearly 500 attendees.